Weight loss might be the number one on our resolution list this year. But no matter what you have tried so far, chances are you have already hit a roadblock by now. At this juncture, you need to understand that there is no mantra or magic for weight loss. It needs right dedication, patience, healthy food, exercise, and more importantly the ability to switch up a program and try new things. 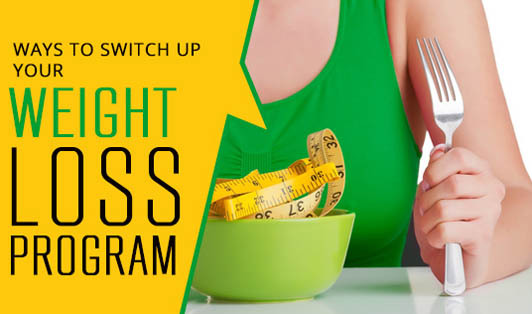 Swap Your Methods: Do not believe that a weight loss program has to work only one way. Try to swap old exercises for new ones. Trying new exercises will shock your body into burning more calories. Try Alternate Sources: Alternate sources of nutrition will help you gain more energy as well as not leave you feeling bored. You can contact your health expert for these alternate nutrition sources. Different Exercises: Monotony is boring. The same exercise cycle will make your weight loss hit a plateau. Try incorporating different exercises and exercise methods in your routine. Skip the Salt: Bloating can also make you feel like you're holding a few extra pounds. Too much salt can lead to water retention and bloating. Lower your salt intake and skip adding salt to your food whenever you can. Do Not Skip Breakfast: It is your first meal and it will help you stay active and healthy through the day. For added benefits, make sure you include a protein source with your normal traditional breakfast. Avoid Overeating: This especially applies for the times you’re feeling low. Overeating will slow the weight loss process and will also flush the last few months of hard work and exercise down the drain.